Selling your lifestyle property? The Property Brokers expert sales team can provide you with expert advice on lifestyle property sales. Now that it is time to move on from your lifestyle property our team have a few suggestions for the sale process to achieve the best possible outcome. Before the market gets to see your wonderful property you need to ensure that it is looking its best. Please ask your sales consultant for some tips on this as they know what works. When this is done please wait for the best day to invite your sales consultant out to photograph the place, professional photography is also something to consider as they just look better. Advertising is all about presentation and placement, your sales consultant can provide you with advice on the best way to advertise your property in a way that it will attract the kind of people who are most likely to purchase your property. Property Brokers has access to an incredible amount of specialised and local publications as well as an in house marketing team. There will be a method of sale that will get the best result for your property in the current market. Your sales consultant will present you with options and the pros and cons of each. The two main approaches are marketing with price or without a price, using a price gives people confidence to make an offer however not stating a price may produce higher offers. Make sure that you have a good solicitor that is experienced in rural property transaction. 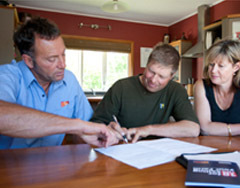 You will need a sale and purchase agreement drawn up ready for any potential purchasers. If there is anything special about your property or any alterations done to building make sure you have the documents to back this up as it makes the process so much smoother.